It was my husband's desire to share his story and his willingness to help me write it that has made this post possible. When our boys were diagnosed with autism, the developmental pediatrician told us that autism is 99% genetic. We didn't think much about this information at the time. But it didn't take long before a thought crept into my mind on an almost daily basis. 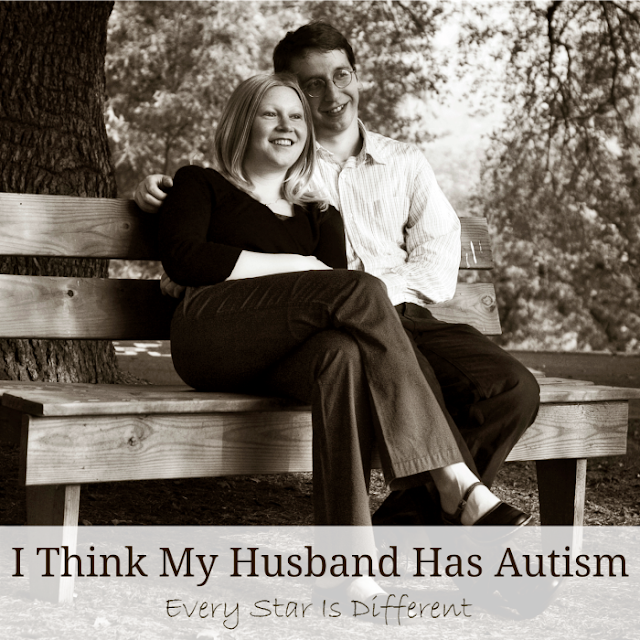 "I think my husband has autism." Jason and I were struggling in our marriage. We had three special needs children. Our finances were a mess. There were foster children in our home. Each brought their own special needs and history of trauma. Life was hard. Jason was struggling at work. This was his fourth job since we'd been married. At each one the same issues kept surfacing. Jason couldn't manage his time at work well. His paperwork was not being completed in a timely manner. He couldn't bring himself to ask for help. When supervisors tried to help, it never went well. They would tell him what to do and he'd attempt to do what they asked, always coming up short. He'd become discouraged and it would all go downhill from there. Disciplinary action would be taken, and we'd wait to see what would happen next. The thing was, he was a great therapist. It was just the time management and paperwork that he couldn't pull off. But that was enough to cause issues every place he worked. I remember the day when I first mentioned out loud to another that I thought my husband might have autism. The person quickly dismissed the idea. And I was okay with that. After all, how could an autistic person be a mental health therapist? This did not make sense to me. Jason's employment ended abruptly. He came home. We decided to work together as full time foster parents, opening up our home to more children. Though I loved the work we were doing, I had never worked with Jason before. Right away I observed that he couldn't finish tasks. He was constantly taking breaks to escape responsibilities. At night he'd play video games or watch sports. I felt like I didn't exist. It wasn't long before the strain in our marriage grew even larger. I thought he was a "lazy selfish jerk." He thought I was a "mean" person. I'd become so frustrated that he couldn't do what I asked of him. We'd have a disagreement and try to work through things, but he'd get so stuck on my words. I couldn't use the words "always" or "never" among others, without him becoming very upset. As emotions grew more intense, he couldn't handle it and would storm off. I always felt left alone on my own to handle things. Jason felt resentful. He thought he was doing the best he could given the circumstances, which felt chaotic and unpredictable. Why wasn't what he was doing ever enough? Time passed and things continued to be difficult. I couldn't figure out if Jason was functioning less over time or if I was just noticing more. The idea that he might have autism kept creeping back into my mind. We knew he had ADHD, but there seemed to be so much more going on. It took me two years to confront my husband with the idea that I thought he might have autism. I was so frightened by how he might respond. If it didn't go well, it could be the final wedge that broke us apart. Our marriage couldn't take much more. Before confronting him, I spoke with the kiddos' developmental pediatrician about my concerns. Instead of dismissing the comments with laughter, she kindly stated that he was definitely pretty "quirky" and that it wouldn't be a bad idea to check things out. When I did develop the courage to speak to Jason, it went better than I thought. He wasn't pleased at first, but it led him to ask a few friends about it. Little did he know how many people would use the word "quirky" to describe him. But that's where the idea of autism stopped. He didn't follow through with doing something about it. The strain in our marriage became greater. Eventually it came to a head and I couldn't take it anymore. I brought the idea that Jason might have autism up to my doctor, who was also Jason's doctor, discussing the behaviors and symptoms I was seeing. Jason wasn't pleased by this, but the meeting pushed him to set up an appointment of his own. I went with him. About eighteen months passed from when I first mentioned the idea of autism to Jason to the time he met with our doctor. At the appointment the doctor went through a questionnaire with Jason. He wasn't aware that one of Jason's "quirks" was that he didn't answer "always" or "never" on questionnaires. The results weren't as accurate as they should have been, as you can guess. 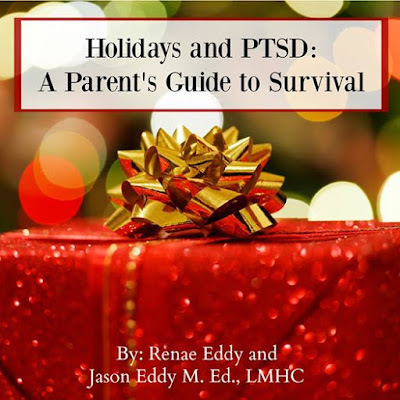 Thankfully, our doctor spoke candidly and said he would have answered the questions differently based on his observations of Jason, and the problems we had reported from home. The results were concerning enough that he made a referral for a full psychological evaluation, to see if Jason met the criteria for autism. Jason had to wait three months to see a psychologist qualified to diagnose him. While waiting for the appointment, we read a book that changed our lives forever. It was called The Journal of Best Practices. The book had been recommended by the kiddos' developmental pediatrician. If you ever wonder if your spouse has autism, this is the book to read. Within the first few pages, an autism questionnaire is mentioned. Jason was determined to find it on the internet and take it. His score came back with a high likelihood of autism. I also took the quiz, just to see if we received similar results. My score was very different with no red flags raised. After taking the quiz and finishing the book, we both knew Jason had autism. As we continued to wait for the diagnostic appointment, we started to analyze Jason's behaviors, sensory issues, and so much more. We wanted to be sure we were ready. The process of receiving a diagnosis as an adult involved several appointments and took about 3 months from beginning to end. Jason was interviewed. I was interviewed. We both filled out stacks of questionnaires and adaptive tests. The doctor tested Jason's IQ. There were interviews conducted with Jason's mother about his early childhood. Sure enough, when all the information had been collected, Jason was not only diagnosed with ADHD and autism, but also an anxiety disorder. Though Jason's IQ score was significantly higher than most, his adaptive functioning was scored low enough that we were told he'd qualify for support services. As the diagnosis became a reality some embarrassing social interactions and awkward social functioning suddenly made more sense to Jason. He realized those "escapes" at home or playing video games at night were ways of self-soothing when he felt overwhelmed or anxious. The adaptive scores explained why he struggles so much with completing tasks, and why he's unable to function in different roles simultaneously. Jason began to make sense of his emotional outbursts and meltdowns. To Jason, the diagnosis meant answers. It was an explanation for almost 40 years of painful and embarrassing moments that weren't so random anymore. A diagnosis brought a sense of acceptance. It also provided a road map for how to make things better. For me, the diagnosis meant that there was hope. I loved my husband, but until that day, I had no idea how to make things better between us. The psychologist gave us two bits of advice that day. The first was that Jason was a very lucky man and could be successful in any endeavor he pursued with the proper supports. The second bit of advice was for him to listen to his wife. He wouldn't be able to evaluate how he was doing, but I could. As long as he was willing to let me help him, we would be okay and our marriage would thrive. It's been over two years since Jason was diagnosed. We initially did pursue support services but quickly learned the process was difficult and very painful for both of us. 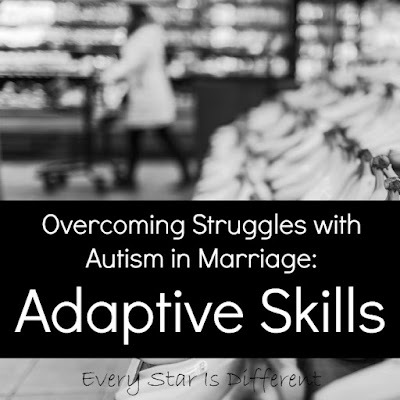 Just imagine piles of paperwork where you describe the worst traits of your husband or yourself, paired with more evaluations and even standing before a judge to talk about just how disabled you are. No thank you! It took about six months for us to adjust to the diagnosis at home, and for me to be able to look at Jason's behaviors as autism traits, and not that of a "selfish lazy jerk." Once I was able to change that mindset, we were able to work on helping Jason be successful at home. At first it was a little difficult for Jason to accept my help. He was always afraid I'd turn back into that "mean" person he viewed me as before. But over time we both began to trust each other again and our hearts healed. His functioning improved. Our marriage also began to improve. As time has passed, we've been able to focus on each other's strengths and utilize them. Jason remains at home full time to help with our special needs children and partners with me here on the blog to bring you the best activities, printables, and resources we can. Since the diagnosis, Jason has had a sincere desire to be the best he can be. He's decided to embrace his autism and be an example for others who may be struggling with it, as he should. Jason is a success story. Whenever I worry about the future of our children with autism, I think about Jason. He has a master's degree. I am his wife. We have four beautiful children. Jason and I own a home and a van. Both of us are working from home to support our family. Anything is possible. We are more in love today than we have ever been. The road has been long and hard, but it's been worth it. And when I think about the things I love most about my husband, I know that most of them are what make him autistic. I am so thankful we had the courage to pursue an autism diagnosis. If you enjoyed this post, you may also like the following. Wow. Quite a journey. Love to you guys for hanging tough. Well done. Good luck in the future. Wow! Timing could not have been better. I have long thought that my husband has HFA. I am also pretty sure he is artistically gifted. The funny thing is that my son has HFA and is highly intellectually gifted. The two are not biologically related. Amazing. This has given me the courage to pursue a diagnosis for my husband who is just coming to terms with the possibility of being in the Spectrum. Thank you! Very interesting read. I can't imagine having to approach such a sensitive subject with anyone, let alone my husband. For my part, my family has a huge history of mental illness, including two children on the autism spectrum, two children with depression and anxiety disorders, two children who are bi-polar, two children who suffer from extreme depression, and they are all male. Each of my sisters and I had sons/son who have some sort of mental issue. Each of our daughters were fine; however, their son's are now exhibiting early signs of some of these disorders - so this is some genetic disorder that is passed from the females to the males. We are currently having this investigated. My son is bipolar, OCD, and ADHD and he has decided he will not have children, as he doesn't want to pass this on to future generations. I'm pretty sure my brother has un-diagnosed bi polar as well, but as he only has daughters we will not know until they have children, if it has been passed on through the male line as well as the female. We have long known that this is genetic; and so far have traced back to my paternal grandmother that she had mental illness. My father did not have any sort of mental illness. Genetics is very interesting, and we are learning as we go, as we did not put the pieces together until our children were in their late teens. Now we are watching the grandchildren for signs. On a more personal note - I tried for years to get my ex-husband to get tested for bi-polar and depression. To this day he refuses to believe that there may be something wrong........and it took a long time for him to accept there was something wrong with his son, so being able to blame the whole thing on me has made it easier for him to not accept his own possible diagnosis. Reading your post felt like I was reading about my life. I too went through the same thing with my husband in the first couple of years of our marriage. It wasn't until my son began to show some signs that he was not hitting the milestones for his age. As a teacher of 15 years I noticed it right away shortly after his second birthday. I quickly seeked help for him. 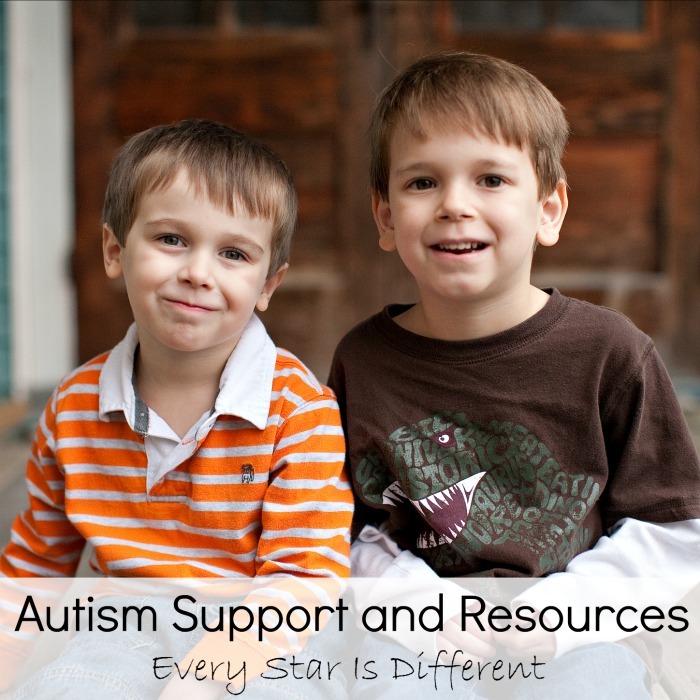 It wasn't until after my son was diagnosed that my husband realized that he too has autism. He said to me: after watching , caring for our son and seeing is when he realized that he too went through the same exact thing. My husband too is a smart man, when it comes to large gatherings he doesn't like it . He's a bit anti-social. I see hope for my son because my husband was able to complete school, graduate and hold a job. I know my son will do well too. So there is hope for our children with the right support system.